An aerial view of the FSU N70 tract. The redish-brown areas have been hand cleared. A sapling stage longleaf pine. Rays of sun filtered down through outstretched branches above my head as I looked up into the canopy of very old longleaf pines. Somewhere in the thick shrubs around me I could hear a brave soul fighting his or her way through the overgrown shrubs trying to free a longleaf pine from the smothering grip of shrubs that had forgotten their place in the fire suppressed landscape. Though he or she was just a few feet away I wasn’t quite sure who it was because a wall of vegetation 10 feet high and probably just as thick separated us. In the distance I could hear the sounds of machinery meeting the shrubs and violently throwing small trimmings, leaves and sticks around. The machines stopped and everything was silent, though just for a moment. From my perspective looking straight up from the little clearing surrounding me the overgrown shrubs were out of view. Without the sound of machinery and bushwhacking reminding me that I was in an overgrown pine forest I was able to imagine that I was actually looking up into the canopy of a well maintained, park-like longleaf pine forest. The machinery started again, the rare moment of silence ceased, and I was violently thrown from my daydream into reality. I was in an overgrown pine forest and it would take a lot of hard work and a few years before the forest of my dreams was a reality. Fortunately, those behind the seemingly impenetrable wall of vegetation also shared my vision of a healthy forest. 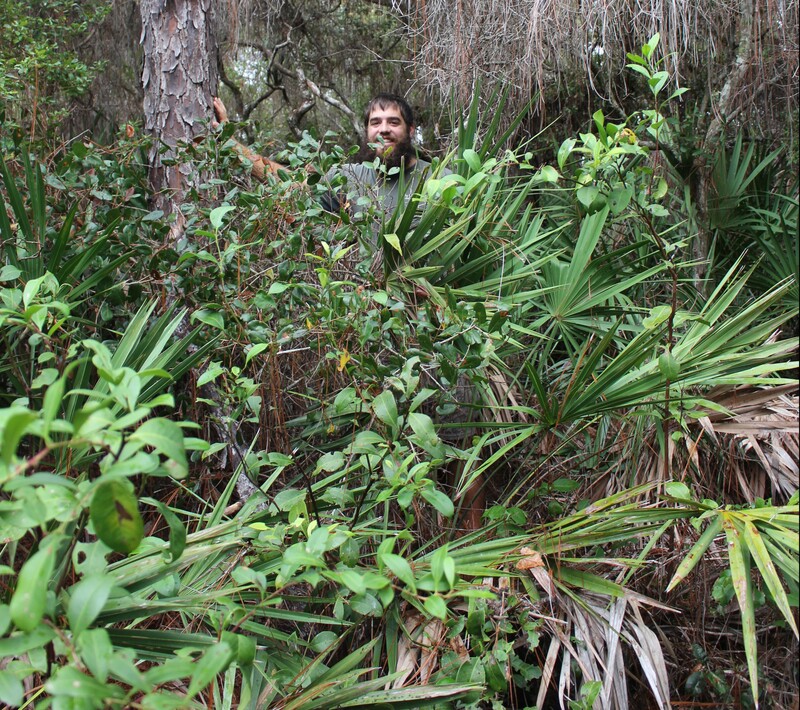 We were all part of a group that was hand thinning vegetation around long leaf pine trees in preparation for the return of fire to the Florida State University Coastal and Marine Laboratory’s (FSUCML) N70 tract. Soon fire will sweep across the property consuming brush, shrubs, downed limbs, and years of accumulated pine straw; opening up space for fire dependent plants such as wiregrass and long leaf pines. However, in fire suppressed forests fire is a tool that must be used carefully. Excess fuel can cause the burn to become too intense and harm trees or start a destructive wildfire. In a healthy longleaf pine forest the groundcover should be grasses and some other plants that are about knee-high. As you can see from the growth around me (I am 6’2″), this vegetation is clearly overgrown. Woody shrubs have displaced other plants. Fires occur frequently in healthy, natural long leaf pine forests. Perhaps John McGuire of the longleaf alliance described it most appropriately, especially for a marine biologist like me, when he wrote, “In the unbroken, primal landscape… fires once frequently moved through these longleaf pine woods like a gentle swell on the ocean’s surface.” Alabama’s TREASURED Forests, Spring 2007, pp. 16-21. Imagine a time before large forests were fragmented by roads, pole lines, agricultural land, developments and other anthropogenic disturbances. One lightning strike could start a fire that burned unhindered for miles until it reached a river or stream. Larger fires meant fewer ignitions were required to burn entire forests. To survive in these conditions longleaf pines and other native plants in the ecosystem developed adaptations that made them resistant to fire. Longleaf pines have fire resistant bark that flakes off the trunk as it burns and they drop their lower limbs to prevent fire from working its way into the canopy. Even young longleaf pines have some resistance to fire. They form little tufts of needles surrounding new growth that so closely resemble clumps of grass that they are called “grass stage” pines. The cluster of needles shelters the growing portion of the tree from fire. The pines can remain in the grass stage for years until canopy space opens above them at which time they bolt up to more than three feet tall in one growing season. This stage, called the sapling stage, is a vulnerable time in a longleaf pine’s life but if they grow fast enough they can reach a height at which flames cannot reach their growing buds. In fire prone systems these adaptations give longleaf pines an advantage over less fire tolerant species. In fact longleaf pines and wiregrass actually promote fire, which helps them maintain their dominant status in the ecosystem. 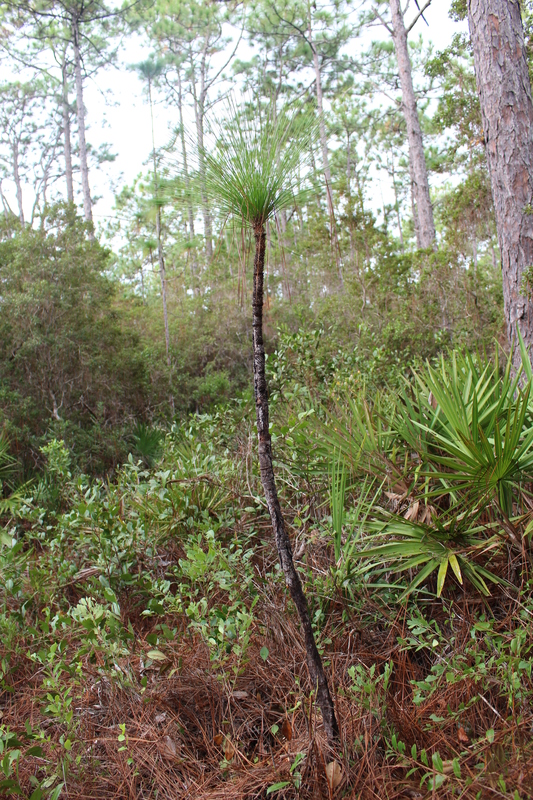 Adult longleaf pines drop flammable needles on top of flammable wiregrass. Both burn easily but not too hot. Together, these flash fuels help promote frequent, low-intensity fires that move through the landscape quickly and cause little harm to the long leaf pine trees. Unfortunately, the whole system is hijacked when fire is suppressed. In just a few years, shrubs that would normally be limited to about knee high height by fires grow taller until they start approaching the lower limbs of pine trees. Additionally, without fire to kill some seedlings, the abundance of shrubs increases. They shade out young pines and herbaceous plants that would normally thrive in the understory. Organic matter such as leaves, branches, and bark accumulates on the forest floor creating a thick layer called duff that smothers seeds of fire adapted species. Ironically, for a longleaf forest in this condition the fire that would normally maintain it can actually destroy it. Flames can climb up shrubs and reach the canopies of pine trees, which can be lethal. Overgrown shrubs and accumulated organic matter burn hotter than the flash fuels of a healthy forest. The higher flames can devour grass stage and sapling pines and can even harm adult trees. To prevent this, the fuels need to be thinned or removed prior to burning. A contractor has been hired to use a machine called a Gyro-Trac to grind up many of the shrubs. The Gyro-Trac makes quick work of stands of shrubs and small hardwood trees but maneuvering the equipment close enough to longleaf pines to remove the shrubs around the trunks is risky business. If the machine goes just a little too far the grinder on the front of the Gyro-Trac could damage the pine trees. To avoid this damage the Gyro-Trac will only clear within a few feet of the trunk. This is where the volunteers come in. Although they can’t cut as fast as a Gyro-Trac they offer a delicate touch and a watchful eye that the vulnerable longleaf pines need, and that no machine can match. 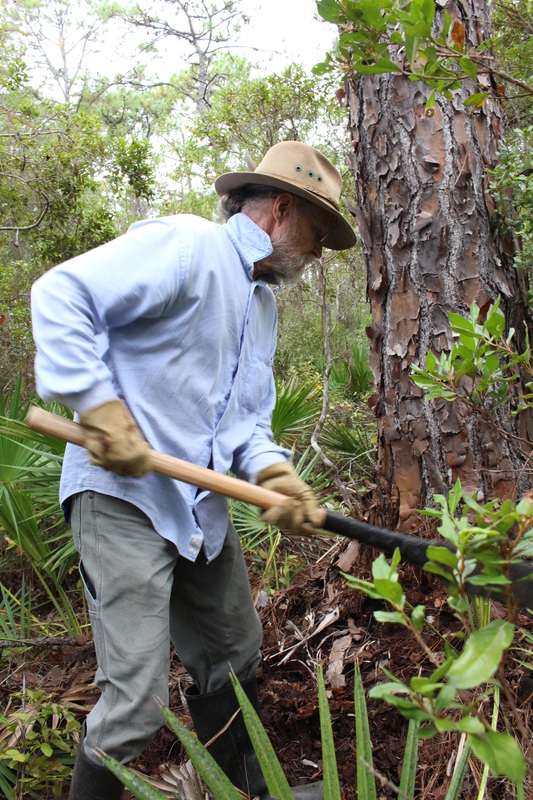 The FSUCML has been fortunate enough to have volunteers from the Sarracenia Chapter of the Florida Native Plant Society, the Florida Forest Service, the Apalachicola Bluffs and Ravines Preserve, Native Nurseries, and the local community help with thinning. It is a daunting task and we might not get to every tree but each tree we have cleared has a greater chance of surviving the fire. For now, we will keep working with the distant, but not unattainable, dream of a healthy longleaf pine forest inspiring us. 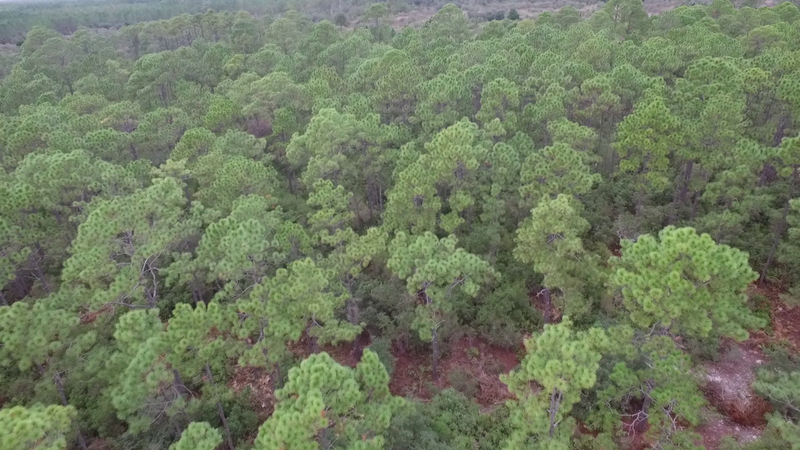 Learn more about this restoration project and Longleaf pine habitats here.